Castell Coch was built for the immensely rich 3rd Marquess of Bute, who employed William Burges as his architect and designer. 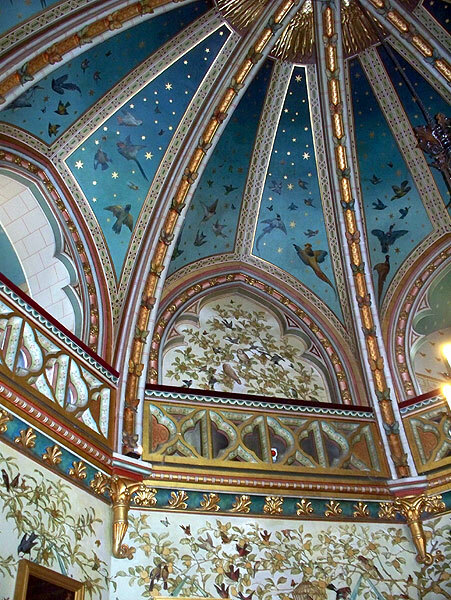 They conceived the idea of rebuilding the ruined medieval Castell Coch and fitting it out with a stylish Victorian interior. Work went on from 1875-91. Burges used the stumps of the original towers and curtain wall, but above that level used his own imagination. In particular, the striking conical tower roofs cannot be references to any original British roofs. Two of the towers are fitted out as a lavish country home and banquet venue, while the third tower, with a plainer interior, was probably used to accommodate servants. There is no guest accommodation, and it seems that the completed castle was rarely used. The first sight of the castle, with its unequal round towers and pointy roofs, is pure Disney :-). The internal courtyard, with its covered walkways, may not strike visitors as being particularly medieval, though such features were known in the medieval period. Indoors, the banqueting hall with its painted walls and ornate barrel boarded ceiling is an impressive room. Next door is the vaulted and multi-sided Drawing Room, probably the finest room in the castle. Above the fireplace is the ‘Three Fates’ a brightly coloured piece of statuary. 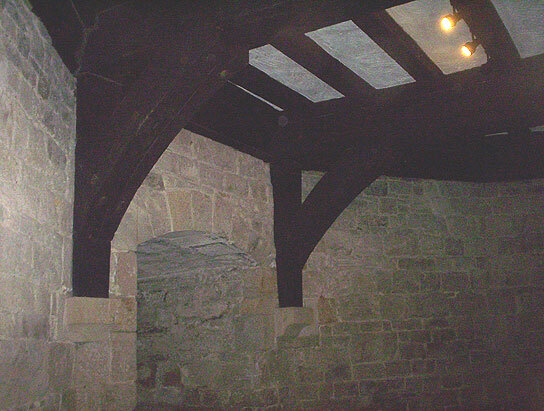 The lower parts of the walls are paneled. Above that the walls are painted with a design of various animal fables. Above that are galeried recesses, and above them the vault with birds and stars. 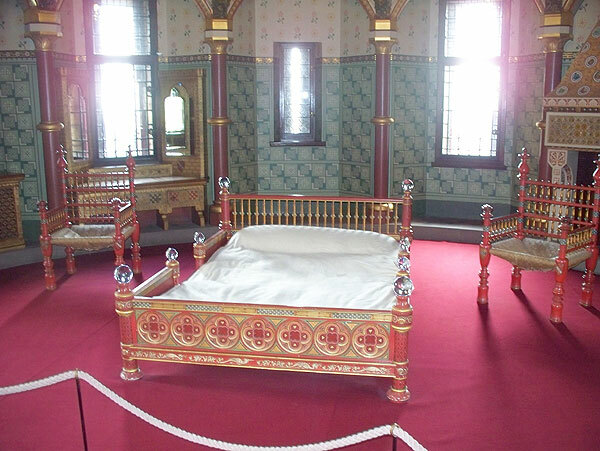 Another impressive room is Lady Bute’s Bedroom, a large rounded room surmounted by a mirrored dome. In the lower part the decoration is Moorish, while in the dome the five rows of painted panels of plants and animals suggest the Aesthetic movement. 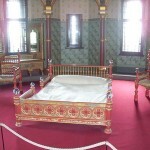 Also of note are Lord Bute’s Bedroom and the children’s room. 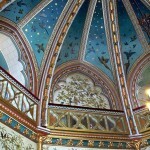 I would suggest visiting Castell Coch followed by the more extravagant Cardiff Castle. 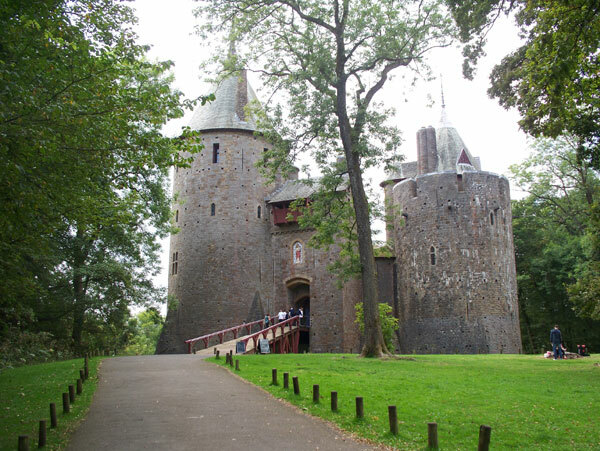 It is possible to look around Castell Coch in an hour and a half, so it is easily possible to visit both in one day. If arriving by car from the south or east, the route involves going up the busy A470 dual-carriageway, coming off at a roundabout and then going south again on a parallel road before passing through the village of Tongwynlais. If using a sat-nav, do not turn right into Catherine drive from Castle Rd – the castle entrance is nearby on the left. Dolbadarn Castle was built by the Welsh prince Llywelyn the Great during the early 13th century. 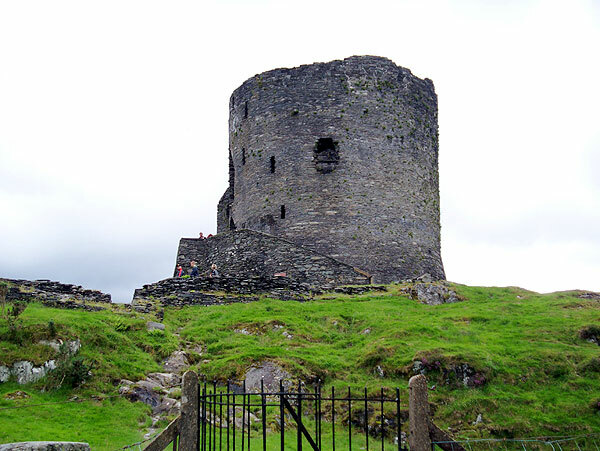 Originally there were three towers, a hall and an East building within the walls on the hilltop, but only the round tower survives to any height. It was taken by the English in 1283. 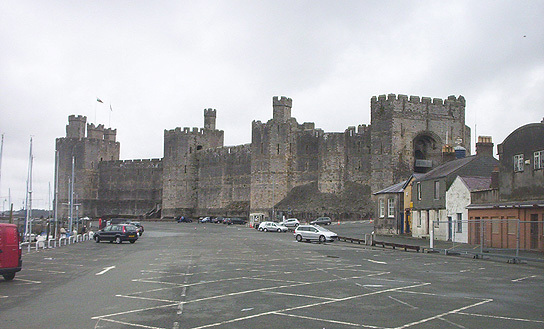 They removed timbers from it to build Caernarfon castle, but parts of the castle continued to be used as a manor house into the 14th century. The keep is still an impressive structure, and the internal spiral staircase can still be accessed to climb from first to second floor levels, though the timber floors no longer exist. There are fine views from the castle mound. Once you know where the castle is (it is visible from the narrow-gauge railway, near the LLanberis stop), it is easily reached on foot from LLanberis. There is no admission charge. 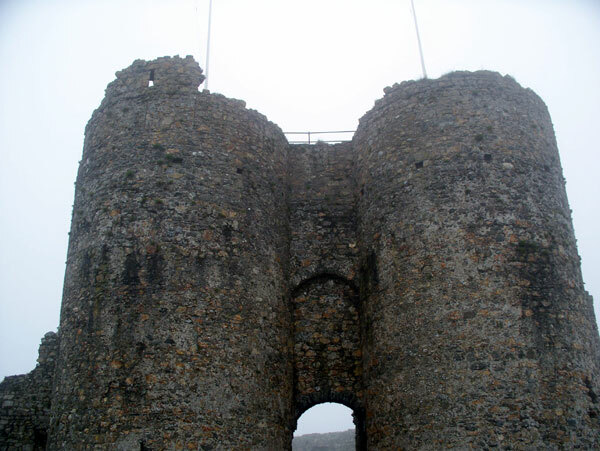 Criccieth Castle is a native Welsh castle whose remains dominate the coastal town of Criccieth. The castle was apparently commenced at the beginning of the 13th century. Later, it was occupied for a time by the English, who are thought to have remodelled it. 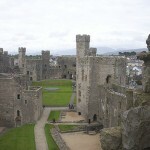 It was destroyed by the Welsh during Owain Glyndwr’s rebellion in the 14th century. 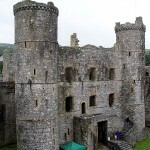 The remains are dominated by the gatehouse, which looks like an English design but was almost certainly built by the Welsh. 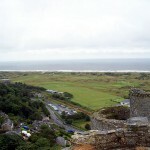 There are superb views from the castle mound as far as Harlech, Snowdonia, etc. Bring your binoculars. The castle is worth a visit if you are in the area. Given its ruined state, looking at the castle will not detain you very long. 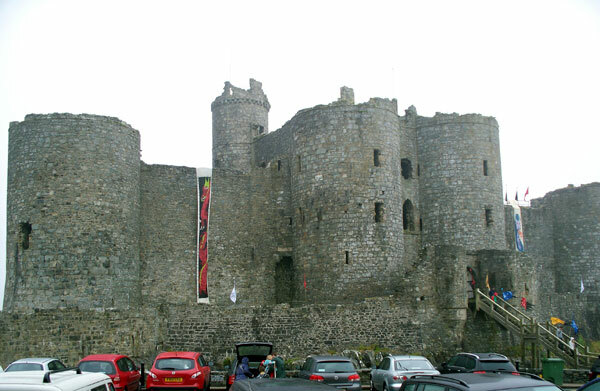 Harlech Castle was built by Edward I in 1283-1289 to subdue the Welsh. 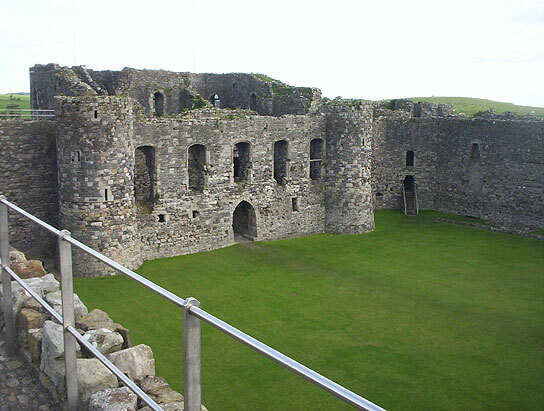 It was designed by the brilliant castle builder Master James of St George, and is one of a ring of great castles built to encircle North Wales. 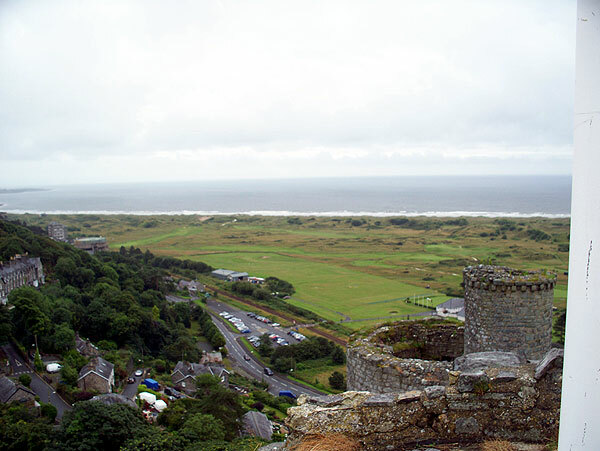 Today, the stone shell of the castle is still substantially complete, and it dominates the flat coastal land far below. 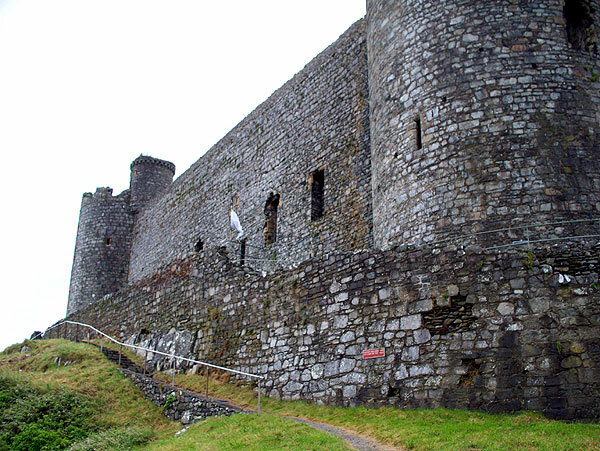 The castle was intended to be resupplied by sea, and a defensible stairway leading down to water level still exists. The large gatehouse is impressive whether viewed from the inside or the outside. The castle was originally surrounded by a lower outer wall which formed a narrow outer ward, but this outer wall is now much reduced in height. 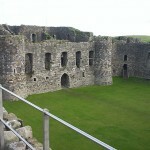 Inside the single inner ward are the footings of various buildings, and the grand stair giving access to the lodgings in the gatehouse. 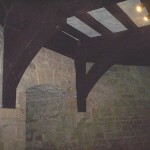 Stairs in the eastern towers give access to the walkway on top of the main walls. An impressive and substantially complete castle, well worth a visit. 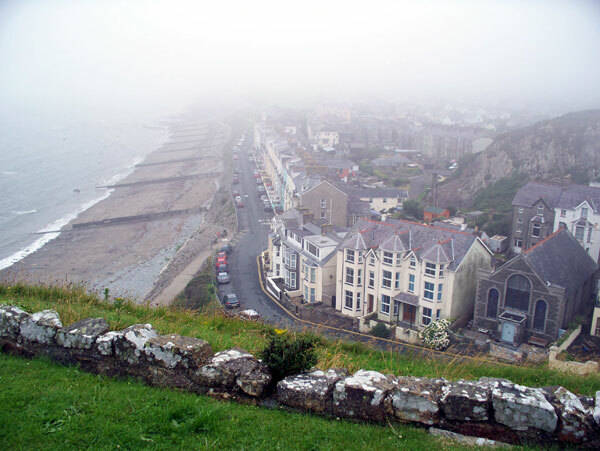 If you are travelling to Harlech from the Menai area of North Wales, note that the A487 is a much faster road than the alternatives, and the “Toll” flagged up by your satnav is a single-track and toll-bridge shortcut across the Traeth Bach estuary east of Porthmadog, which costs 50p. 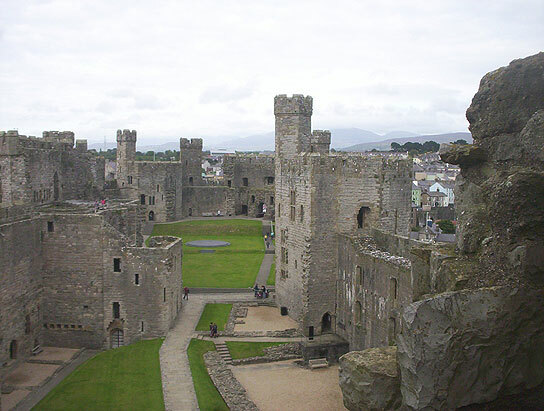 Caernarfon castle was built for Edward I by his gifted castle designer, Master James of St George, starting in 1283. The walls of the castle and the connected new English town were substantially complete by 1285. It was built to include a royal residence. 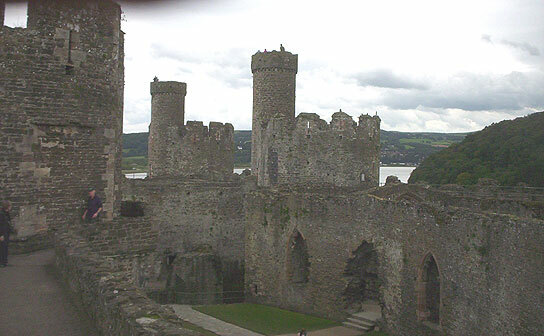 The Welsh over-ran town and castle in 1294, the lack of wall between town and castle proving a fatal omission. The English re-took it, and by 1330 work to complete the castle had ceased. It last saw action in the Civil War, and repairs were carried out in the 19th century. The castle is huge, and towers to an impressive height over the town and harbour, still looking fairly complete. 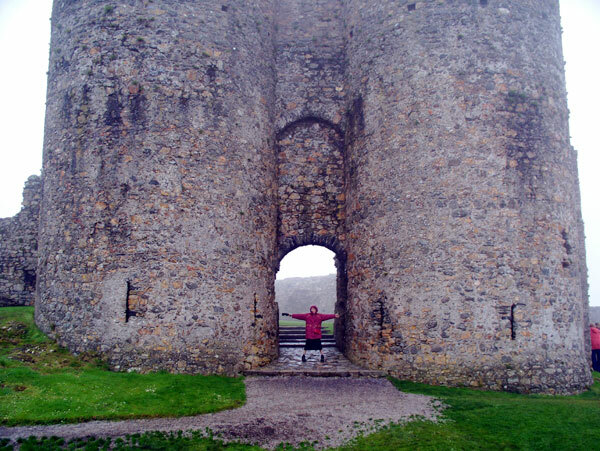 Like Beaumaris, it has walls honeycombed with passages which can be explored. At the site of the kitchens, the remains of ovens and piped water supplies can be seen. Some towers have been re-roofed and contain exhibitions. I climbed to top of one of the several watch-towers for a vertiginous view of the surroundings. Inside one of the thick walls, a chapel can be seen. This is one of the finest of the Welsh castles. Well worth a visit if you are interested in castles. What next? 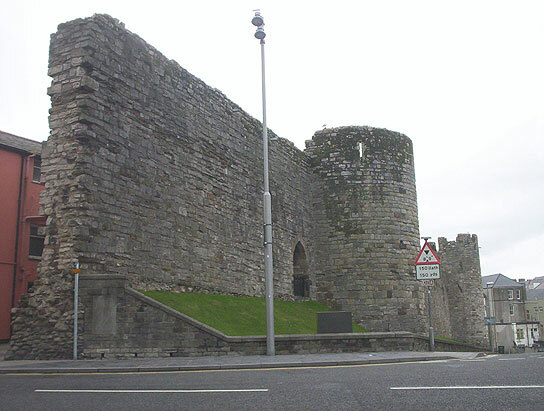 There are sections of the Caernarfon town wall nearby, also the Welsh Highland railway terminus, and the Roman fort of Seguntum is on the outskirts. 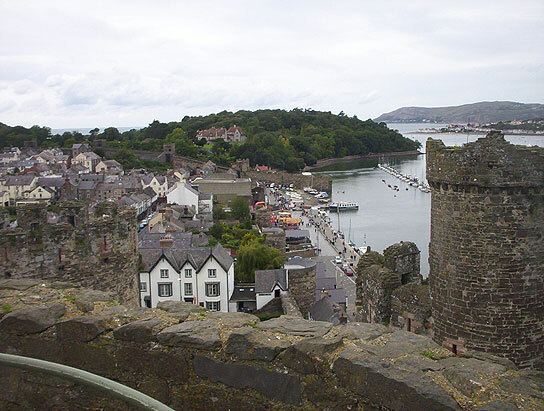 Conwy was designed by Edward I’s master builder James of St George, and is one of the most impressive of all the Welsh castles. 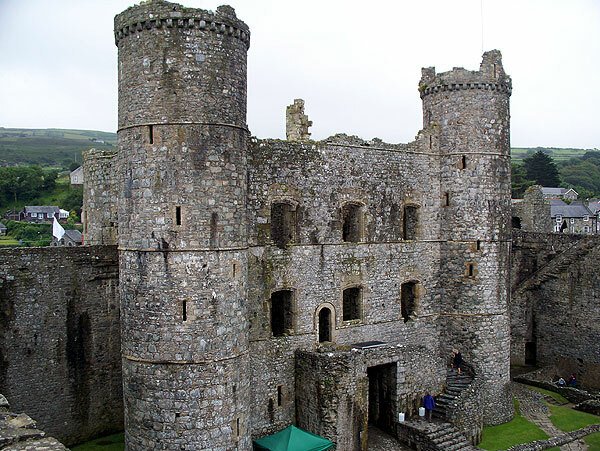 The eight towers and curtain wall surround an inner and outer ward, and there is a barbican at each end. 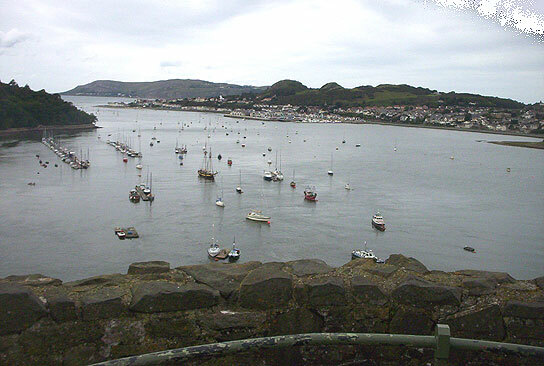 Conwy was beseiged in 1295 and 1403, and last saw action in the Civil War. 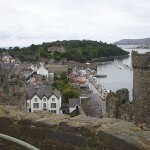 Conwy castle is huge and hard to miss – the attached town wall and gateway makes it seem even bigger from a distance as one approaches from the direction of Chester. The castle itself is remarkably complete, with 8 full-height towers, spiral stairs, and walkways around the walls. There are many rooms and passages to explore. It’s hard not to be excited by it all. Even its towers have smaller watch towers which you can climb, if you are not petrified by heights. 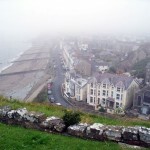 There are great views over the town and estuary, and the two historic bridges (turnpike and rail). 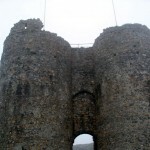 Close up, the castle can be annoyingly difficult to reach by car, owing to vague signage. 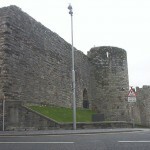 In fact, there is a small parking area inside the town walls, near the castle ticket office, and a large parking area outside the walls and below the castle. The brown signs lead to the latter, or rather the trail peters out just before the anonymous car park appears on your right. The huge castle, meanwhile, looms above, completely hidden by the car roof. What next? On no account miss exploring the town walls, which still encircle the old town. Much of the town wall still stands and there is a walkway along the top of several sections. Telford’s old suspension bridge is in the care of the National Trust. 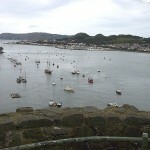 Beaumaris is one of the great castles of North Wales built by the English monarch Edward I, to stamp his authority on the Welsh. In the 13th century, its concentric walls within walls design was the state of the art in military technology. It is said to be the most technically perfect of all Welsh castles. It was the last of the great castles to be undertaken by the King’s designer Master St George, and remains in a relatively good state of preservation. 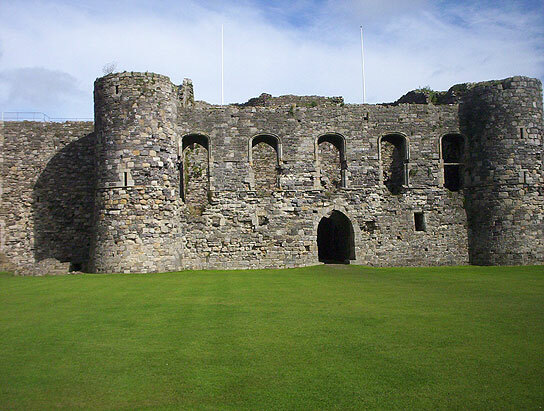 Beaumaris Castle is situated near the coast, and at sea level. It looks unexpectedly squat, partly because of its low siting, but mainly because the towers were never completed to the originally planned height (the King ran out of money). 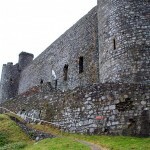 It is surrounded by a moat, an outer defensive wall, and an outer bailey, before one reaches the main walls and towers. Inside, the inner bailey looks big enough for a football pitch. The inner walls are honeycombed with defensive passages, and the inner and outer walls have walkways on top, some still accessible. You can spend a couple of hours exploring it all. Well worth a visit if you like castles. Pay car parking is available nearby. Also in Beaumaris town, the old gaol is worth a visit, as is the old courthouse. Together they vividly recall the harshness of Victorian justice. In the jail, inmates were properly fed and given medical attention as required, (which was much better than most of them got outside) but to prevent them liking jail too much, the regime was very harsh. Sentencing was also very harsh, especially for property crimes.